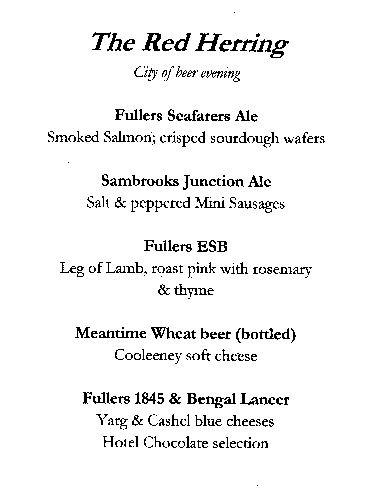 There was a bit more to the London City of Beer launch last week than I mentioned at the time: after introducing the project to the assembled media, we were treated to a London beer and food tasting – well, all the beer was from London, but the food wasn't, although it was all from the British Isles. 1. Fullers (Gales) Seafarers Ale with smoked salmon on crisped sourdough wafers – basically thin toast. Somehow the salmon brought out the fruitiness of the beer, while the beer deepened the salmon. 2. Sambrooks Junction with salt and peppered mini sausages. The beer, with its roasted barley and malty notes, cut through the slight fattiness of the sausages to reveal them at their meaty best. 3. 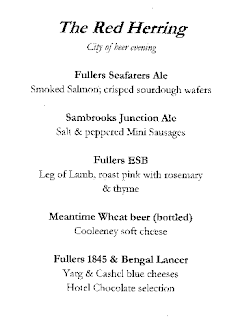 Fullers ESB with leg of lamb, roasted pink with rosemary and thyme. The classic Fullers marmalade notes plus ESB's dark dried fruit beautifully contrasted the sweetness of the meat. 4. Meantime Wheat beer, in small champagne-style bottles, with Cooleeney (Irish) soft cheese. The spicy and faintly tart hefeweizen was an interesting match for this Camembert-style cheese. I wasn't convinced, but others thought it great. 5. Bengal Lancer with Yarg (Cornish) and Cashel (Irish) cheeses. This beer was a better match for cheese in my view, its assertive dry yet fruity hoppiness both the creamy and salty cheeses. 6. Fullers 1845 with a selection of white, milk and plain chocolate mini-ingots from Hotel Chocolat. Some people might have gone for the obvious here – a porter, Fullers London Porter even! - yet the rich fruitiness of 1845 demonstrated that sometimes a little contrast serves to show up each partner's best points rather than their worst ones. During all this, Roger kept us entertained with a string of anecdotes and background information. For example, we learnt that ESB is a UK trademark of Fullers so there are no other ESBs made here, whereas in the US it has become a popular generic style, and that Bengal Lancer had its first success not in the UK but in Scandinavia – apparently the Fullers marketing people didn't think it would sell here, so they shipped it to Sweden instead. Bizarre. Anyhow, the food was excellent, and in the circumstances it was just as well that it was sample portions rather than a slap-up meal, as the latter would have taken longer and probably would have detracted from the beers rather than enhancing them. Yes, a lot of Fullers beers in there, but we were in a Fullers pub! And apparently while more breweries had been invited to participate, they had not been able to do so for various reasons. I'd love to think that there will be a “next time” for them to have another go at attending. Here's hoping. In the meantime: beer with food. You know it makes sense.